To playback recorded sessions, the web application must have the video playback URL where the final recorded sessions are stored. Under the default root website, the media server configures IIS with a virtual directory called SessionRecording. This URL should be provided on the User/Session Management dialog. The SessionRecording URL may be presented with or without SSL but should use anonymous authentication. Open the management console. Click Manage Web App. Double-click an existing web application to edit. 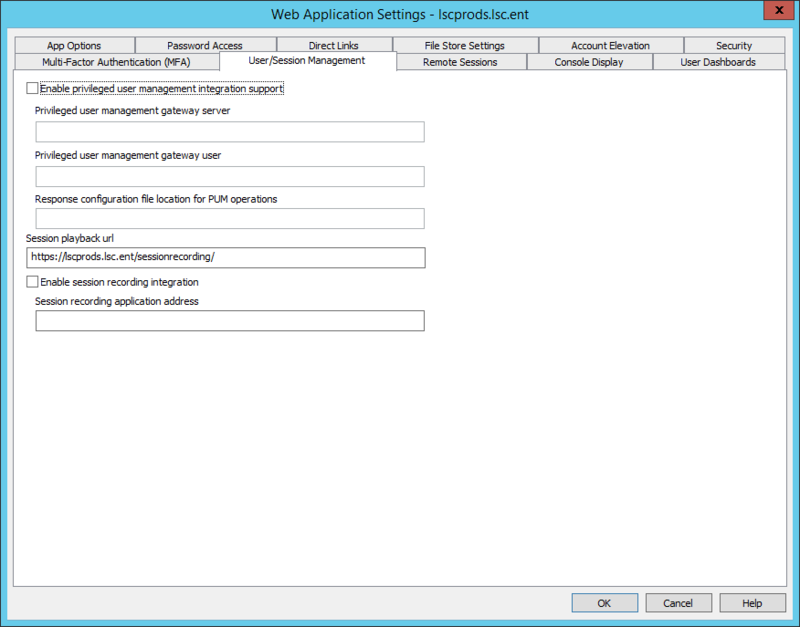 Or, change the default options by opening Options > Configure default web application options. Locate the Session playback URL field and enter the URL for the media server. If using HTTPS, make sure to enter the valid name of the server matching the assigned name on the certificate to avoid certificate errors. A typical URL is similar to https://server.example/sessionrecording/. Be aware that the system is expecting a trailing forward slash at the end of the URL. If updating an existing website with this new information, click OK. The new settings are pushed to the web instance and its COM application is restarted. If changing the default web application settings, right-click on the website instance and select Replace instance options with default web application options. After making this change, there is no need to restart any systems. Once the URL is added and sessions have been recorded, users with access to the Auditing section of the web application are able to play back recorded sessions.